The second coolest thing at the Linq, after the High Roller of course, is Brooklyn Bowl. A dining, bowling, concert and nightlife mecca, featuring 32 lanes of bowling, a highly-acclaimed menu from Blue Ribbon, live acts in a 2000 capacity arena and DJ dance parties. 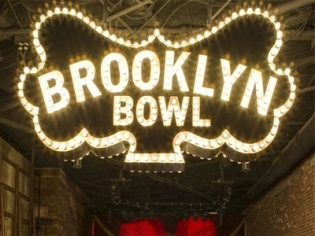 Brooklyn Bowl is setting the standard for a new entertainment venue in Vegas. The newest sibling of the original Brooklyn location, the Las Vegas version is 3x bigger and even more fun with a jam-packed concert schedule, and a menu that ranges from wings, pizza, barbeque and catfish to vegetarian choices. Choose to bowl in the two story bowling alley that also features bottle service or maybe just pop down on the weekend for brunch until 4:00 PM. There is an outdoor deck overlooking the Linq’s Central Plaza which provides some fresh air after enjoying the DJ-spun music in the nightclub. We were very pleased with this place. The menu selection was good and the food was reasonably priced and tasteful. We went bowling and saw a concert. I recommend going to this one. Brooklyn Bowl is so fun! Came here for a concert, but also tried bowling and the restaurant as well. No complaints at all. I really want to come back.